Carrick Rangers player Danny Magill. Kind-hearted Carrick Rangers players are taking a hit in the pocket this week to aid an injured team-mate. 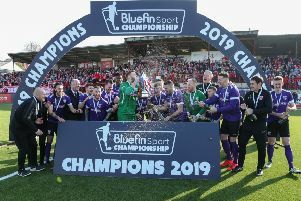 The Bluefin Sport Championship footballers are forgoing their wages to help defender Danny Magill, who has undergone surgery for the anterior cruciate ligament tear he suffered in the final minutes of a pre-season friendly match against Bangor at the end of July. And the procedure is very much thanks, in no small way, to the generosity of the players, management, and the club chairman. The 21-year-old now faces many months of physiotherapy and will miss the entire season. It’s been a huge blow after he signed with the club for his seventh consecutive term - almost immediately after returning from university in Leeds. In August, Danny posted on social media that, despite the disappointment, he was glad to have the support and encouragement of all the lads at the club around him, and he had the determination to come back even stronger next year. But in a massive statement, those players and management have gone even further, forgoing their wages for this week to help with the considerable cost of private surgery, which would otherwise have been at least 18 months down the road. Away from the game, Danny has recently taken up a marketing role with the Belfast Community Sports Development Network, where he works alongside many like-minded sports people, including former Carrick Rangers manager Gary Haveron, who gave him his first-team debut four years ago. It’ll be, in his own words, “a tough old season ahead”, but he’s up for the challenge.